View of “Content is a Glimpse,” 2018. The title of this exhibition refers to those moments of intuitive recognition that can strike when one contemplates painting; as Willem de Kooning said in 1960: “Content is a glimpse of something, an encounter like a flash.” Per de Kooning, curator Jurriaan Benschop is especially interested in the ways figuration can be found in gesture, color, and abstraction, and he notes a similar approach in the five painterly positions here. 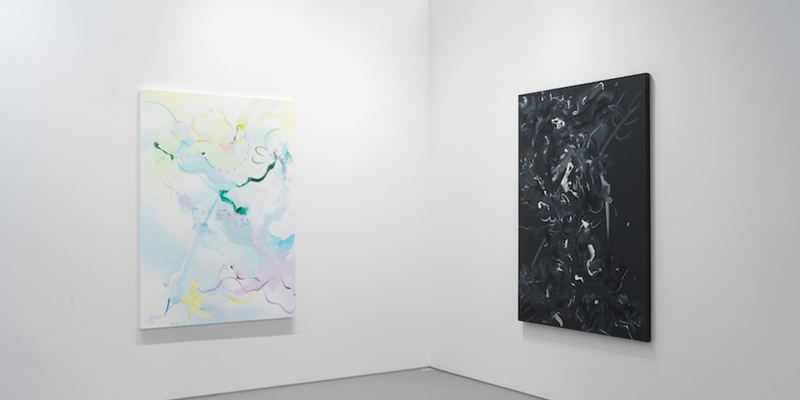 The gray and black, minimalist nuances of David Schutter’s AIC G 219, 2014, and GSMB W 21, 2015, make the two small paintings seem introverted, as if they intend to obscure their subjects. For his process, Schutter studies, makes sketches of, and takes notes about old-master canvases in museums then develops images of the works in his studio from memory. In these pieces, he makes reference to Watteau and Géricault, though he’s concerned less with the question of motif and more with an investigation into painting’s compositional aspects, brushwork, and handwriting. Astonishingly, Schutter’s grays are never the result of simply mixing black with white—only after a months-long painting process in which colors blend do the valences of gray emerge. The figurative is made notably more explicit in the works of Anna Tuori—torsos, hands, legs, and other elements conduct a life of their own. Here, the figure is fragmented into an abstract store of forms, which the gaze then assembles anew. And alongside works by Jorge Queiroz and Mark Lammert are the bright pastels of Fiona Rae’s Faerie gives delight and hurts not, 2017, and the blacks and whites of Figure 1l, 2014, from her “Greyscale” series. Both of Rae’s paintings model the figure in an indirect yet fascinatingly opulent way. Her dynamic stream of painterly gestures allows for an intuitive impression of form—a “glimpse”—to appear out of baroque abundance.